As many of you know, I've been on a hiatus. I'll be back soon. In the meantime, I got a huge bump in traffic this week after someone over at FARM FRESH TO YOU (with over 13,000 Facebook likes) posted my easy and delicious fall recipe. 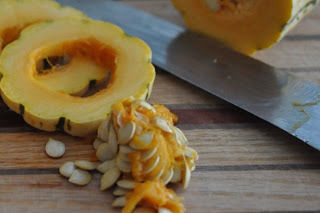 Roasting the seeds from winter squash is the vegivore-locavore's equivalent of "nose to tail" cooking and delicata squash is the perfect "nose to tail" vegetable as every part of the squash is delicious, skin and seeds included (the skin on the delicata squash is so thin there's no need to peel it). Serve hot or cold alongside a glass of red wine, hot apple cider or glass of sherry. Any winter squash, such as a pumpkin, delicata, acorn or butternut squash, can be used. 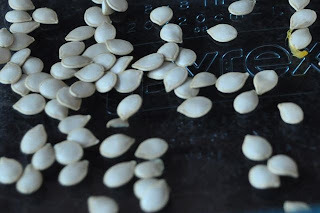 Save the seeds and rinse with water to remove the orange pulp. Pat dry with a paper towel to remove excess moisture before spreading out on the pan. 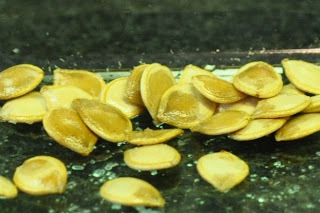 Drizzle with a small amount of oil (I used a local sunflower oil) and stir to coat evenly, then bake until golden brown. Preheat the oven to 275 degrees (F). Oil a cookie sheet or baking dish with a thin layer of oil or line with parchment paper. Save the seeds from a winter squash, such as delicata, acorn or butternut squash, and rinse with water to remove the orange pulp. Pat dry with a paper towel before spreading out on the pan. Drizzle with a small amount of oil and stir to coat evenly. Bake for 15 minutes or so until golden brown. Remove from oven and cool. Generously sprinkle with salt.